Title Unit Testing Succinctly - Learn how unit testing can be integrated in your development cycle. eBook PDF (128 Pages, 2.21 MB), Kindle, etc. Unit testing can be a valuable part of any development cycle, but it can easily cause more problems than it prevents if used incorrectly. 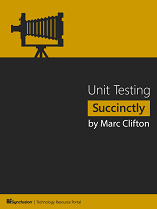 With Unit Testing Succinctly by Marc Clifton, you'll learn what you need to know to leverage unit testing and minimize the number of bugs introduced in development. The book clearly defines what does and does not constitute units and tests, different approaches to implementing unit tests, and even the far-reaching effects that unit testing can have on the architecture of your application. The book clearly defines what does and does not constitute units and tests, different approaches to implementing unit tests, and even the far-reaching effects that unit testing can have on the architecture of your application.